Maybe you’ve heard of it, maybe your grandparent did it, maybe your friends are doing it. Cooking with cast iron is easier than you think, and is a great alternative to using stainless steel or non-stick pans. Because cast iron absorbs and distributes heat more evenly, it is a joy to work with and yields better results once you get used to it. To succeed with cast iron is a four-fold process, then before you know it you’ll be talking shop about cast iron with all your peers and elders. One: Selecting your cast iron. If you’re buying new, pick out a pan that suits your needs size wise, or consider buying a large skillet and a small skillet. New pans often come pre-seasoned. It should say on the label. Lodge is a very good brand, be it expensive. Follow your gut and pick a pan that appeals to you. If you’re buying used, from a thrift store or garage sale, make sure there are no cracks or deep pockmarks. Most likely you will be removing the seasoning from this pan and re-seasoning it. Directions for that will follow. A little rust is acceptable as it will be dealt with in the seasoning stage. If you’re getting your pan from a friend or relative, ask them about how the pan was used. If for instance they cooked bacon every day and you are a vegetarian, you will probably want to strip the existing seasoning and re-season it. If you’re pan is used begin by washing it thoroughly with hot water and soap, scrubbing it with steel wool inside and outside to remove any gunk or rust. With a really tricky number, you may need to combine soaking and scrubbing at intervals until all gunk in gone. The pan will appear greyish and porous, but it’s ok if it’s surface is not completely even in color and texture. As you scrub the old seasoning will be flaking off in pieces. Get it all out of your system now because this is the last time you will ever use soap on your skillet. Meanwhile, preheat your oven to 400. Rinse your skillet well and allow it to dry completely in the hot oven. a high heat oil such as a non-gmo corn oil or a refined coconut oil. The safe heat-range of any good quality oil should be displayed on the label. Look for one that is safe in a 400-500 degree range. Smear inside and out, including the handle. Place the pan or pans upside down in the hot oven. Put a piece of foil or a baking sheet on the rack beneath to catch any oil that drips off. Bake your pan for at least an hour, then turn off the oven and leave the pan inside to cool gradually. For best results, repeat the seasoning process, sans the washing part, at least once. Remember to do things in this order, and you will do just fine. 1. Heat your skillet. This opens the pores in the iron to receive the cooking oil or fat. 2. Add your preferred cooking oil or fat to your skillet once it is hot. This ensures that the oil will soak into and coat the pan instead of swimming around in your food. Animal fats like bacon drippings, butter or ghee are your pans best friend, but it’s understandable if you are vegan and prefer to use vegetable oils. Please always choose good quality oils and use them within their safe temperature zones. 3. Cook away. Look at you go! If you find your pan is too hot at some point, remove from heat, then reduce the heat and bring the pan back to the burner. While your pan is still hot, use a hot pad to bring it to the sink. Rinse the pan with warm water and scrub off any food that remains. Use a sponge or scrubby that is designated for this and never touches soap, or you will be back to square one! Don’t try to scrub off the oil, only the food bits. If the food is really on there, fill your hot pan with water and simmer on the stove, using a spatula to scrape off bits, until the food is loosened and can be scrubbed off. No. Soap. Once your pan is food bit free, it’s back to the stove to be dried. Turn on the burner as if you were beginning to cook again and heat your skillet until it is completely dry. Once dry, remove from heat and coat the inside, and occasionally the outside, with oil using a folded up paper towel. Oil is the bread and butter of iron pans. 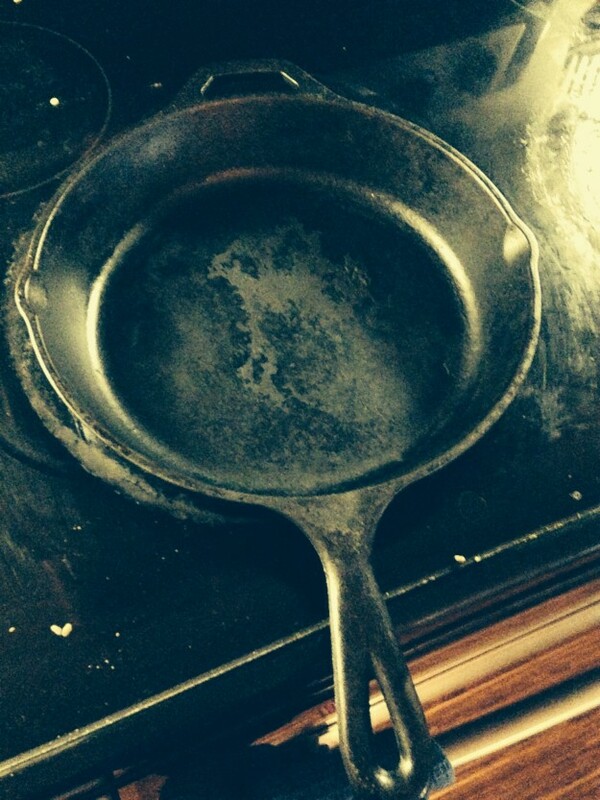 It gradually creates the seasoning of the pan that keeps food from sticking to it and protects it from rust. Do not fear the oil. If you’re worried about germs, recall that you are making your pan piping hot on the regular. There will probably be an adjustment period with your pan mostly related to figuring out how hot to get it and how much oil to use to prevent sticking. Don’t worry, you’ll figure it out.